WASHINGTON, DC, July 21, 2010 (ENS) – Designers will begin this summer on cool roof replacements for the Department of Energy Headquarters in Washington, and Energy Secretary Steven Chu Monday announced a series of cool roof initiatives underway across the department. 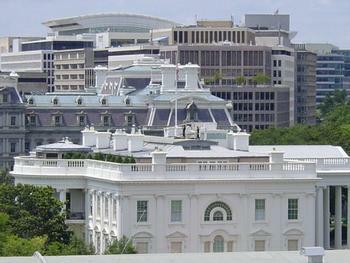 Secretary Chu also is encouraging other federal agencies to re-roof their buildings with cool roof technologies. Cool roofs use light-colored roofing surfaces or special coatings to reflect more of the Sun’s heat, helping improve building efficiency by reducing cooling costs and offsetting carbon emissions. Cool roof projects are also underway at Idaho National Laboratory in Idaho Falls and Brookhaven National Laboratory in Upton, New York. Collectively, these projects will cover over 350,000 square feet and save thousands of dollars for taxpayers annually. Under President Barack Obama’s Executive Order on Sustainability, the federal government is committed to reducing its greenhouse gas emissions 28 percent by 2020. As part of that effort, Secretary Chu has directed all DOE offices to install cool roofs, whenever cost effective over the lifetime of the roof, when constructing new roofs or replacing old ones at DOE facilities. With cool roofs, these federal buildings will consume less energy, offset additional carbon emissions, and save taxpayers money. In a letter to the heads of other federal agencies sent Monday, Chu encouraged them to take similar steps at their facilities. To offer additional support for federal and commercial building operators that want to install cool roofs, DOE released its Guidelines for Selecting Cool Roofs, which provides technical assistance on types of roofing materials and how to select the roof that will work best on a specific facility. Roofs and road pavement cover 50 to 65 percent of urban areas. Because they absorb so much heat, dark-colored roofs and roadways create what is called the “urban heat island effect,” where a city is warmer than its surrounding rural areas. Cool roofs reduce the heat island effect and improve air quality by reducing emissions. A recent study by researchers at Lawrence Berkeley National Laboratory found that using cool roofs and cool pavements in cities around the world can help reduce the demand for air conditioning, cool entire cities, and potentially cancel the heating effect of up to two years of worldwide carbon dioxide emissions. DOE’s cool roof research effort includes developing advanced testing protocols, conducting urban heat island analyses, and undertaking studies to further quantify the direct global cooling benefits associated with cool surfaces. The Department also anticipates awarding new projects to develop higher performing, new innovative roofing materials under the Department’s Small Business Innovation Research grant program. The National Nuclear Security Administration, an agency within the Department of Energy, has already installed more than two million square feet of cool and white roofs at sites across the country. Through the Roof Asset Management Program, NNSA currently saves an average of $500,000 a year in energy costs and expects to save more than $10 million over the next 15 years. Overall, NNSA has reduced building heating and cooling costs by an average of 70 percent annually on reroofed areas by installing cool roofs and increasing insulation.